When a gray whale swallows a royal seal, various factions set off to find it, including bandits, pirates and the government that lost it. Soldier Sa-jung defies his commander and following a duel with his former master Hong-gab he defects to the wild and becomes the leader of a group of bandits. Meanwhile pirate Yeo-wol leads a mutiny against her cruel captain So-ma. Soon they cross paths, but can their acrimonious meeting turn into an uneasy alliance? With a ridiculous concept and a strung-together narrative that is more of an excuse to insert large set pieces than anything else, The Pirates announces itself as brains-off entertainment from the outset. For the most part it strives to be silly fun, however it is also burdened by the broad emotional territory it tries to touch upon. Gussied up with cartoonish make-up and hair, it’s a tall order to take the characters seriously, so any time the film does tries to raise the stakes it begins to stall. Above all, The Pirates is looking to be a breezy (though nevertheless expensive) action comedy. The film has been called the Korean version of Pirates of the Caribbean (2003) since it was announced and the final product does nothing to dissuade us of that assumption. With the same kind of unlikely and tumultuous showpieces and a lead aping the earlier film’s famous star protagonist, it doesn’t feel like the filmmakers made much of an effort to distinguish themselves from the earlier hit. Some of the set pieces, such as an enormous wooden wheel breaking off its hinges and flattening everything in its path, are even lifted right out of the US franchise. The Pirates seems so similar (though inferior) that at times it borders on copyright infringement. Considering its clunky script, awkward set pieces and tonal dissonance, The Pirates is already weighed down by a shipload of problems but the film’s most significant drawback is the miscasting of its leads. Called on to play a hard-as-nails warrior pirate is Son Ye-jin, an actress generally known for her demure characters. No amount of dark eye shadow, fancy costumes and clever editing can mask the fact that she is playing a character that is out of her comfort zone. Sadly, Korean cinema lacks its fair share of strong women’s roles and within an industry driven by men, those parts are by and large highly sexualized and/or feminized. Save for Ha Ji-won (Duelist, 2005), the local industry lacks performers who have been groomed as convincing female action leads. 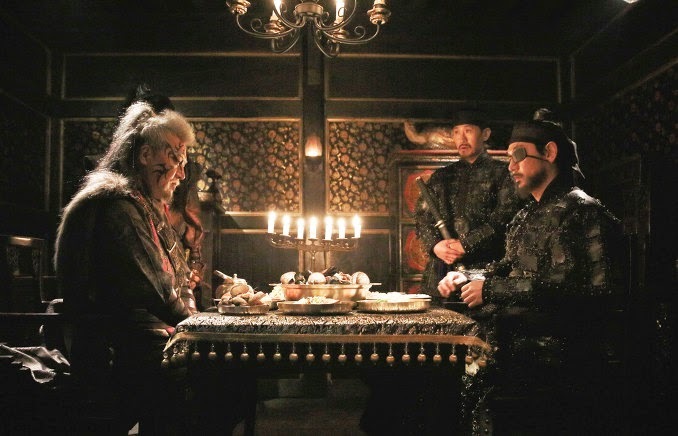 Ham-fisted and erratic, Kim Nam-gil offers up a weak copycat performance of Johnny Depp’s Jack Sparrow that strives hard for broad laughs but rarely tickles the funny bone. While Depp played Cpt. Sparrow’s moral ambiguity to great effect with both extravagance and subtlety, Kim’s wide mood swings and antithetical actions only serve to fracture the character and show it for the hodgepodge that it really is. The more experienced supporting actors may not be demonstrating their best work in The Pirates but their workmanlike consistency makes the affair bearable. Garnering the most laughs are the at odds Yu Hae-jin and Park Cheol-min, two of the most familiar faces in Korean cinema. Director Lee Seok-hoon makes a big effort to pull out all the stops with outlandish set pieces and all kinds of action. But the devil lies in the details and poor execution mars what could have been goofy fun. Terrible rear-projection and poor choreography give the film a rushed, slapped together feel that undermines its hefty price tag (reportedly $15 million). The sea battles, not to mention the boats they take place on, pale in comparison to Roaring Currents, while the costumes and make-up are reminiscent of the similarly miscalculated The Huntresses. Following a high school comedy (See You After School, 2006), a romcom (Two Faces of My Girlfriend, 2007) and a hit dramedy (Dancing Queen, 2012), Lee seems an odd choice at the helm. He has excelled at situational comedy in the past and his characters have always been caricatured, but while his previous leads have been endearing, the protagonists in The Pirates are neither relatable nor fun. Action comedies are a hard thing to pull off at the best of times but with uneven plotting, poor execution and some baffling casting decisions, The Pirates never lays claim to its own identity, which remains buried beneath its many follies.